As all older siblings tend to do, my brother picked on me quite a bit growing up. I remember one such prank quite vividly, and I'm sure he does too. One morning, I poured myself a bowl of Rice Krispies, then got up from the table to do something. When I returned and took a big bite, my cereal was so salty that I almost threw up. I, being a (slightly manipulative) little sister, immediately burst into tears, and of course my brother was punished. His punishment? He had to eat the entire bowl of salty rice krispies. Parenting win, right there. 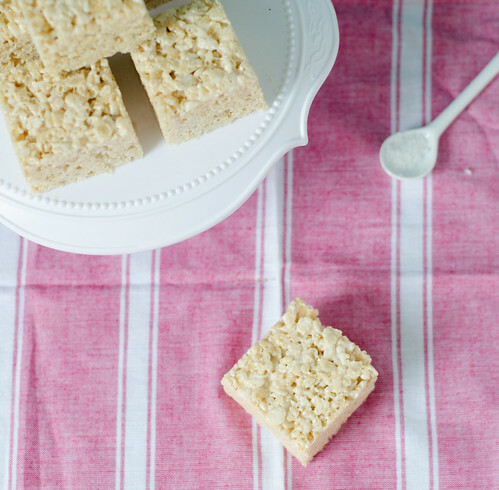 It feels kind of awkward to write about such an unpalatable experience, especially when I'm sharing with you the best rice krispies treats ever, but as I added salt to these babies, I couldn't help but remember that prank. 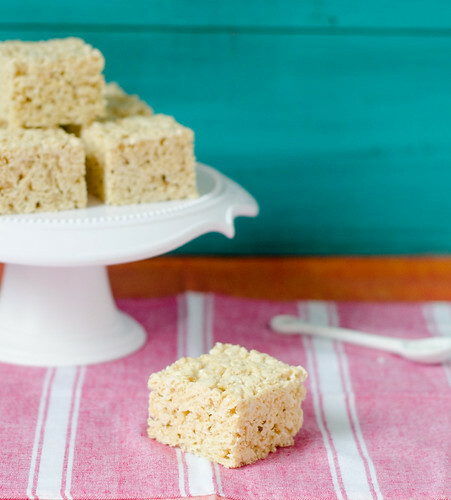 So about these rice krispies treats. I don't want to sound overly effusive or lame to be waxing poetic about such a simple treat, but hear me out. I've seen tons of crazy add-ins and variations on the ubiquitous treat, some sounding great and some causing me to scratch my head a little. But what makes this version so great is its simplicity. There's more butter, and it's browned. And a sprinkle of sea salt helps to balance out the sweetness of the treats. Like fleur de sel, brown butter automatically gives every dessert a flair of sophistication and an extra depth of flavor. It's not that you'll taste these and immediately proclaim that you can taste the browned butter. More likely, you'll taste them and wonder what's in there that makes them taste so darn good. You still have that nostalgic and homey childhood treat, but it's matured a bit - much like us, I dare say. I don't think my brother would still pour salt into my cereal, but I daresay he would love these salted treats! Butter a 9-inch square baking dish and set aside. In a large pot, melt the butter over medium-low heat, whisking and swirling it often. After it melts, it will foam, then turn golden, then finally start to brown and smell nutty. As soon as this happens, remove the pan from heat and stir in the marshmallows and sea salt. the residual heat in the pan should be enough to melt the marshmallows, but if they aren't melting, return the pan to the stovetop over low heat, stirring constantly, just until they melt. Remove the pan from heat and quickly stir in the cereal. Immediately transfer the mixture to the prepared pan, then use a buttered spatula to spread the mixture evenly to the corners and edges. and smooth the top. Allow to cool, then cut into squares. If you are are terribly impatient, you can just eat it with a spoon. I won't tell anyone. Krispie treats like this make me so happy!! Dreamy. Just so dreamy. Brown butter always gets me extra excited. These look yummy. I don't see a "save" button, do you offer the option to save recipes? Me too! I want to brown butter all the things!! Made these last night, can't wait to make them again.....like today lol. Thanks for sharing!